Bought these to replace JVC bookshelfs. Was not disappointed. The clarity & richness of these speakers come through no matter what the music genre. They remind me of the B&W P5s I have. No 2 songs sound the same. Each song sounds like how it was made; in other words, the T15s doesn't put its' own stamp on everything; rather it treats each song or genre individually, so what you get is pure sound. I bought the T 15s after reading the majority of positive reviews posted on the web. Having owned them for 8 months now, I can safely say that these speakers can't be beat within their price point. The bass response sounds somewhat better in person than in print. 60 Hz isn't particularly impressive, but the Polks handle it well and as long as you don't push them too aggressively, they sound very good. With good analog source material they're capable of sounding fantastic. I'm biased against digital (Can't stand it in the extreme!) so the fairly 'blah' sound I get with CD's through the T 15s is par for the course in my humble opine. Push some vinyl through these speakers, however and they really get an opportunity to dazzle. You could easily spend a bit more money for something you'll end up liking far less. I can't imagine anything cheaper bettering these, though. I just bought a pair of these Polkaudio T15 speakers from "BestBuy", on sale, to spread the sound system from the TV/AV system in the living room to the kitchen/dinning room. I was hesitant to deal with BestBuy and the $59 sale price. However, listening to these speakers, compared with all of the other bookshelf speakers in the store, to my ears, they far surpassed the fidelity of all others priced much higher. So, I took the chance, brought them home and connected them via a wireless "rockfish" transmitter and receiver. Having set them up, aiming them so they provide as balanced sound as I can, between the living room 5-channel speaker system, to their sound in the kitchen dining area, I love the sound. My quest, for my wife, was to give her music, TV audio, FM, whatever... in the kitchen dinning area. Apparently, I made a good choice. She loves the sound as I do. Currently, I've got Mark Knofler's "Screen Playing" piped throughout the 1st floor and anywhere in the kitchen dinning area it sounds like it's coming through high end head phones. I'm very tempted to go back and buy a few more pairs, with "rockfish" transceivers to send the sound throughout the rest of the house. So far, great product at a great price. I'm sure there are other sound systems for the whole house that, if I had thousands to spend would be better. However, at least to my old ears, these are great! I can't wait 'til the subwoofer comes in to enhance the bass throughout the 1st floor. 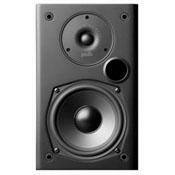 I bought these Polk Audio T15's just for a change in the sound of my home theater. are fantastic speakers, don't get me wrong, I just like to listen to different systems. I also own a pair of Bowers and Wilkins 805s. running for $124.99, how could I go wrong? I listened to music for the next 4 hours! I couldn't get over how musical these speakers are. a Polk Audio CS10 center channel I found on ebay sold by Newegg for $59.99. Now if anyone is counting, that is $460.00 + tax for a complete speaker system, WOW! to the full Bowers and Wilkins system I have have dreaming about for years. the desired results you are looking for. I definitely give Polk 2 thumbs up! I Just purchased these Speakers for My Den / Home Office, paired with a Vintage Pioneer SX-434 Receiver, which I run my computer/tv music through..Impressed..for $99.98 @ Best Buy, perfect for my office. I also Run a SX-727 through my series II Bose 601's for my home system..both Pioneers have been refurbished, and updated..So, I'm somewhat surprised at the sound quality of the Polk's. The first move was to replace the passive sub with a powered one. I replaced that with a Polk Audio PSW 10, Along with the new sub I replace the zip line speaker wire with 12AWG speaker cables for the fronts and center. That liitle bit of change made some nice improvements in sound. But I was reading a few reviews about the Polk Audio T15's and thought it would be nice to have matching speakers across the front sound stage. The T15's arrived and I slipped them in the spot of the LX'5's. Right away I notice a wider sound stage and more depth in the sound. I was not sure if it was the new toy effect or was I hearing what I thought. I put the T15's through a few paces using test sounds through my squeezebox and then the Blu ray. The T15's handle it all with ease and continue to bring forth a nice balance between the sub and center channel. The LX5's are no slouch with the fame lithuam ribbon tweeter, but I think time has caught up with them. I had bought a new receiver and hooked it up to an old set of AIWA bookshelf speakers. I had not owned a receiver of some years and the old AIWAs were not sounding to good with the new receiver. I purchased the T-15's to use temporarily as my front speakers and moving them to my rear channels when I have enough money for some Polk Monitor 30's or 40's. I hooked them up and they are receiving 80w from my Pioneer receiver and they sound GREAT!! I've sent my Home Theater and Music signals through them. They matched pretty well with my sub and are crossed over at 150hz but these speakers make me feel like i need to upgrade my sub also. They sound that good. The highs are clear and crisp and the mids are warm. To me they put out a more sophisticated sound and lets me know what I have been missing all these years. I know there are better speakers out there that will amaze me even more but I like these very much and would recommend them anytime especially at the price you can get these at. I could leave these as my fronts and be very happy for years to come. I bought these to replace a pair of RCA 3 ways with 12" woofers. I've had a powered sub for years and decided I did not need those huge speakers anymore. These Polks are powered by a Harman Kardon 2 channel stereo receiver that puts out 75 watts/channel. They hang high on the wall aimed down and in toward the listening area. I've never had "small" speakers before and was afraid of these having a small, tinny sound. I'm so glad I was wrong! They have about 40 hours of use and sound great after breaking in. Surprisingly they have almost as much bass as the RCAs(a sub was still required even with the big speakers). The T-15s have adequate mid bass-they won't shake the house with ultra low frequencies, but that's what subwoofers are for. Highs are crisp and clear. Mids and vocals are warm and not muddy. If you crank up some heavy metal really loud, the sound can get harsh. But that holds true with just about any speaker. When listening to jazz, they sound awesome! I can't speak for how they sound with movies-don't do the home theater thing. But with music they please my ears. Sure there are better sounding speakers out there. But for $105, I'm impressed. I purchased this set from BB for a little over $100. I currently use Klipsch Synergy III F-1's as my fronts(no sub needed!) They put out plenty for any genre of music or movie. I was looking for either a good center(for movies or a good set for my backs) so i went shopping around.. I was more for a good center. but your average center channel is gonna run you $200+. So to keep the story short I went ahead and bought the T15's. Took them home and set them up immediately. Out of the box they had a good solid weight and feel to them. I was curious to try them as my center channel, so i went ahead and Bi-wired them so to speak through my DENON avr-589(75w/ch) and WOW! My movies are so much clearer and crisp. I don't have to track back in my movies if i feel i that missed something, the dialogue of the movies are outstanding! Voices are clear and right in front of you. I have them double stacked on there sides with the grills off to the right of my LCD on top of my receiver, it's truly a beautiful site. I never truly experienced Dolby Digital until now.. If you want to save a few bucks on a great center get these! They are small enough to blend and look mean at the same time. I also tried them as 2ch stereo listening, they have great soundstage, enough to fill any room. For just over $100 I feel they were a steal! I'll be honest with you, you have to take them home first.. don't judge them in the BB store, facts are that most of the the speakers on display at BB have been abused at some point or another and ran with crappy wiring. They sounded 10x better at my home than the audition i gave them at the store. 5stars! Get them!